Mario Balotelli haircut in the Nike Barbershop ad. Now Nike wants to extend the campaign with the “Nike Barbershop”, which is an integrated advertisement that features famous Italian football player Mario Balotelli receiving a haircut accompanied by other stars – Javier Pastore and Mamadou Sakho. 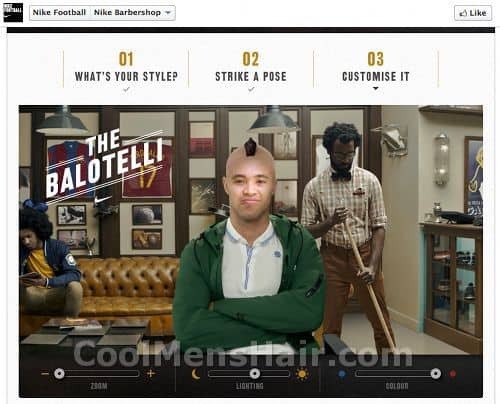 Mario Balotelli is a Manchester City’s controversial striker and he features in the advert for the “Nike Barbershop”. He says that he just wants to be remembered. That’s why he allowed a barber to give him the haircuts of popular legends, including Carlos Valderrama and Ronaldo, before making his famous mohican. It is a very comical advertisement, and hairstyles have nothing to do with being a good football player. But here you can see some quite interesting hairstyles. In case you live an active life and always keep other people guessing, you should choose a new haircut, which can set you apart. This campaign was developed at LEG Paris. Besides, there is an interactive Facebook app, which enables all viewers to try out some iconic styles of famous football players and share them with their friends. It is possible to choose from haircuts of Ramos, Neymar, Sakho, Mario Balotelli, Ozil, Welbeck, and Pastore. This way, you may get a change to visit a physical Nike Barbershop location. Nike Barbershop application second step: Strike A Pose. Nike Barbershop application third step: result & customise. Nike Barbershop locations: Buenos Aires, Madrid, Mexico City, Milan and Paris where the latest styles can be fixed for real.